Over the last 10 years 802.11 technology has made remarkable strides -- getting faster, stronger and more scalable. But one problem still haunts Wi-Fi: reliability. Nothing is more frustrating for network managers than users complaining about flaky Wi-Fi performance, spotty coverage and dropped connections. Dealing with a Wi-Fi environment that you can't see and that is constantly changing is the problem. And radio frequency interference is the culprit. How are large-scale, dense Wi-Fi networks affecting radio management issues? RF interference can be generated by almost any device that emits an electro-magnetic signal -- from cordless phones to Bluetooth headsets, microwave ovens and even smart meters. But what most companies don't realize is that the single biggest source of Wi-Fi interference is their own Wi-Fi network. Unlike licensed spectrum that devotes a swath of bandwidth to the highest bidder, Wi-Fi is a shared medium that operates in the unlicensed RFs within the 2.4GHz and 5GHz range. When an 802.11 client device hears another signal, whether it is a Wi-Fi signal or not, it will defer transmission until the signal ceases. Interference that occurs during transmission also causes packet loss, which forces Wi-Fi retransmissions. These retransmissions slow throughput and result in wildly fluctuating performance for all users sharing a given access point (AP). While spectrum analysis tools are now being integrated into APs to help IT staff visualize and identify Wi-Fi interference, they are useless if they don't actually fix the problem. The problem of RF interference is only exacerbated by the new 802.11n standard. 802.11n typically uses multiple radios within an AP to simultaneously transmit several Wi-Fi streams in different directions to achieve faster connectivity. But now, twice as much can go wrong. If just one of these signals runs into interference, the ability to spatially multiplex or bond channels, two fundamental 802.11n techniques that help to yield dramatically higher data rates, is effectively eliminated. Three popular approaches to addressing RF interference include lowering the physical (PHY) data rate, reducing the transmit power of the affected AP or changing the AP's channel assignment. While each of these can be useful in some respect, none of them addresses the fundamental problem of dealing directly with RF interference. The vast majority of APs on the market today use omni-directional, dipole antennas. These antennas send and receive transmissions equally in all directions. Since these antennas always transmit and receive exactly the same in all situations, when interference crops up, these systems only have one option to combat interference. They must lower their physical data rate until an acceptable level of packet loss is achieved. Yet lowering the AP's data rate can actually have the opposite desired effect. Packets are now in the air longer, which means there is a greater chance of losing those packets because they take longer to be received -- making them more susceptible to periodic interference. This approach is highly inefficient, and subsequently all users sharing this AP experience poorer performance. Another common method for Wi-Fi design is to reduce the AP transmit power to make better use of the limited number of channels. Doing this reduces the number of devices sharing an AP, which can improve performance. But lowering transmit power also lowers the signal strength received by the clients. This translates into a lower data rate and smaller Wi-Fi cells that can create coverage holes. These holes must be filled with more APs. Adding more APs creates -- you guessed it -- more interference. Finally, most WLAN vendors would have you believe that the best approach to dealing with Wi-Fi interference is "channel changing." This is where a different or "cleaner" channel is automatically selected for the AP when RF interference increases. While changing channels is a useful technique to deal with continuous interference on a given frequency, interference tends to be highly variable and intermittent. With limited channels to change to, this technique can cause more problems than it solves. Within the 2.4GHz frequency, the most widely used Wi-Fi band, there are only three non-interfering channels. 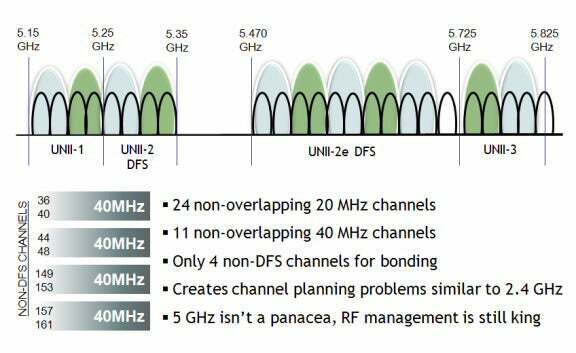 Even within the 5GHz band, only four non-overlapping 40MHz wide channels exist after eliminating Dynamic Frequency Selection (DFS), a mechanism to allow unlicensed devices to share spectrum with existing radar systems. Channel changing by an AP requires connected clients to disassociate and re-associate, causing disruption to voice and video applications. Channel changing creates a domino effect as neighboring APs change channels to avoid co-channel interference. Co-channel interference is created when devices interfere with each other by using the same channel or radio frequency to transmit and receive Wi-Fi signals. To minimize co-channel interference, network managers try to architect their networks -- and the limited spectrum available to them -- by spacing APs far enough apart so they can't hear or don't interfere with each other. However Wi-Fi signals don't stop and travel beyond these architected limits. The channel changing approach also doesn't take into consideration what's best for the client. In these scenarios, interference is determined from the vantage point of the AP. But what does the client see? Will moving to a cleaner channel really benefit the user's experience? A common metric for predicting how Wi-Fi systems will perform is the Signal-to-Noise (SNR) Ratio. SNR compares the difference between strength of the receive signal level and the noise floor. Typically a higher SNR results in fewer bit errors and higher throughput. But as soon as interference comes along network managers have something else to worry about: the Signal-to-Interference plus Noise Ratio, also referred to as SINR. SINR is the difference between the signal level and the level of interference. Given the negative impact of RF interference on user throughput, SINR is a much better indicator of what kind of performance can be expected from a Wi-Fi system. A higher SINR translates into higher data rates and more spectrum capacity. To achieve a high SINR, Wi-Fi systems must either increase signal gain or decrease interference. The problem is that conventional Wi-Fi systems can only increase signal levels by adding more power or by bolting on high-gain directional antennas to their APs which increase gain in one direction, but limit coverage to a smaller area. Recent Wi-Fi innovations in the area of adaptive antenna arrays now enable network managers to get the gain and channel use advantages of a directional antenna while still covering the same area with fewer APs. The holy grail for Wi-Fi is the ability to send a Wi-Fi signal directly to a user and monitor that signal to ensure it delivers the best possible throughput -- all while constantly redirecting Wi-Fi transmissions over signal paths that are known to be clean without changing channels. New Wi-Fi technologies that marry dynamic beamforming and miniaturized intelligent antenna arrays (so-called "smart Wi-Fi") come closest to this wireless nirvana. 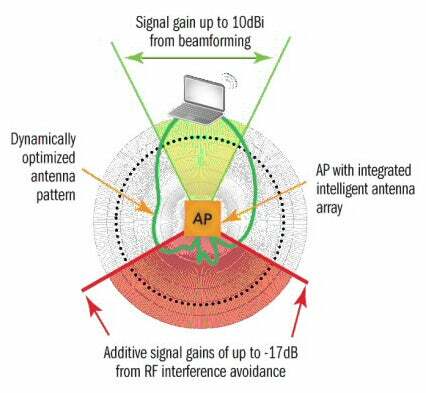 Dynamic, antenna-based beamforming is a new technique developed to alter the form and direction of RF energy as it emanates from the AP. Dynamic beamforming focuses Wi-Fi signals only where they are needed while automatically "steering" them around interference as it occurs. These systems use different antenna patterns for every client, changing antenna patterns as problems occur. For instance, when interference is experienced, a smart antenna can select a signal pattern with attenuation in the direction of the interference, thereby increasing SINR and obviating the need to lower the physical data rate. Antenna-based beamforming uses a number of directional antenna elements to create thousands of antenna patterns, or paths, between the AP and client. RF energy is now radiated over the optimal path that yields the highest data rate and lowest packet loss. Standard Wi-Fi media access control (MAC) client acknowledgements are monitored to determine the signal strength, throughput and packet error rate of a selected path. This ensures that the AP knows exactly what the client is experiencing -- and the AP has complete control to change to a better path if there is interference. Intelligent antenna arrays also actively reject interference. Because Wi-Fi only allows one user to talk at a time, antennas not being used to transmit data to a given client can ignore or reject interference that would normally inhibit Wi-Fi transmissions. This results in significant signal gain up to 17dB in some cases. But perhaps the biggest benefit of this new technology is that it operates without manual tuning or human intervention. For network managers, mitigating RF interference is only becoming more important as a flood of new Wi-Fi-enabled devices hit enterprise networks. At the same time, user expectations for more reliable Wi-Fi connections capable of supporting streaming multimedia applications are skyrocketing. Coping with RF interference is the key to addressing these mega trends in the enterprise going forward. But getting there means taking a more intelligent and adaptive approach to dealing with out of control radio frequencies that are causing all the ruckus. Ruckus Wireless markets and manufactures a wide range of indoor and outdoor "smart Wi-Fi" products for mobile operators, broadband service providers and corporate enterprises around the world. Ruckus invented, and has patented, technology that steers signals around obstacles and interference. This extends signal range and ensures consistent, reliable distribution of delay-sensitive multimedia content and services over standard 802.11 Wi-Fi. For more information, visit Ruckus Wireless at www.ruckuswireless.com.